Thanks for this blog post! This worked really well for me. Just wondering if you had any thoughts on how to generate labels for specific samples only. For example i've plotted over 300 exomes and I want to quickly know which ones have Depth ≤10 for 90% of target bases. Secondly, this works well for exomes but I've found it doesn't work so well for genomes unless you're looking at target regions (eg. the exome capture regions). What do you think is the best way to apply this to genomes? A bedfile with 1MB windows? I've used textxy in the calibrate package to do this, but you'd have to manually place the label using x and y coordinates. I'm not sure how to automatically produce these in a sensible location. RE whole genome, I'm not sure why you couldn't use a similar approach, but I suppose breaking up into fraction of 1kb or 1MB windows covered at X depth could work too. You'd have to play around a bit to see what makes sense. Hi Septhen, this also worked nicely for me. Thanks for sharing. Just a question (which might be more suited to Aaron than you): do your bam filles contain paired-end reads? If so, is there some double counting in coverageBed? I tried to look for an answer but no dice. nohup ./bashscript.sh & and it does not work. Any suggestions how to run, not sure why it is not working when parallel is there. 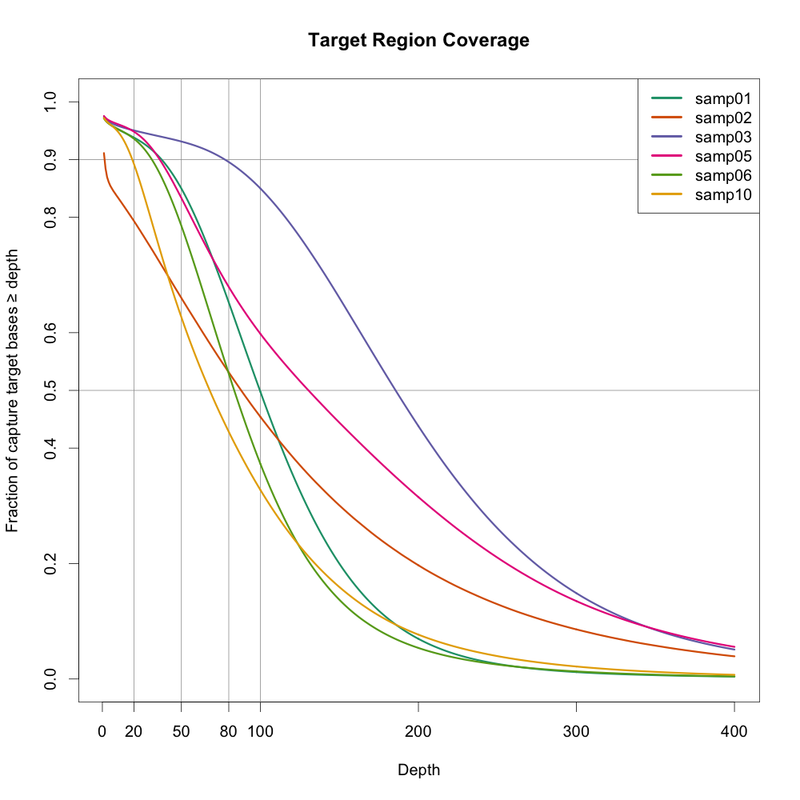 Is there a way to calculate coverage for WGS? Thanks, this was really useful. Here are the commands I used to plot it with ggplot. Thanks for posting this update -- saved me some time! Hi Stephen, thank you for this post, it really helped me a lot and I think that this dataset of coverages and fractions is very powerful for a lot of QC analyses. I want to second Brandi's comment about changing -abam to -b and -b to -a.